With the newer release, we have the following major new features and upgrades to our existing features. 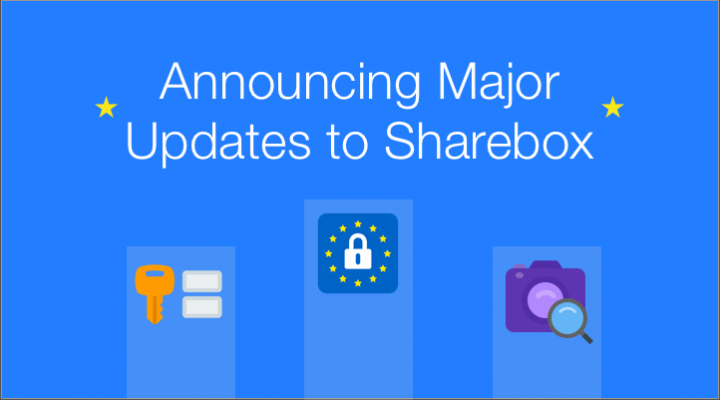 While Sharebox has always been secure, there was room for improvement. So in the latest version, we added a new token system that ties the Sharebox Token to the browser that was used when the Sharebox folder first opened with. It will have its own expiry date/time. The association with a browser prevents the user from leaking data by accidentally forwarding the token email. The expiry (not to be confused with the date a share expires) prevents a token from lying dormant in the inbox, i.e if not activated within a set time period, you have to request a new one. This feature has been requested by our customers and available to all other customers with the newer version. The former single email based authentication will continue to work for the customers who choose not to enable this new feature. We have worked on providing a seamless automated migration path for existing Sharebox folders if you choose to migrate to this newer authentication system. After the configuration retention period, any data stored in the audit log is deleted automatically, and you can optionally select to completely delete Sharebox share and the uploaded files. You can also choose to option to anonymize them (remove the external users' email address). Last but not certainly the least, we have added content and preview support. For files of select Image formats and office files that can be transformed to PDF, external users can now preview them within the external client. The file types depend on the setup of your Alfresco repository server. If it can be previewed as PDF there, it most likely can be shown in Sharebox. All preview actions shall also be audited. We will be happy to let you try Sharebox out on our Showcase server. Just contact us. Or you can just read more, checkout videos, and download a product paper from our Sharebox page.